Depending on where you live, you may think of only one type and not even know that the other exists. Read on for everything you need to know about these two different versions. 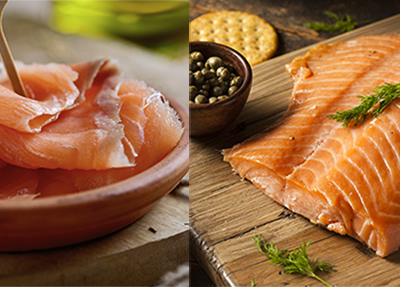 What is the main difference between hot-smoked salmon and cold-smoked salmon? Smoking temperature! In fact, in terms of process, the temperature used during smoking is the only difference. Cold-smoked salmon is smoked below roughly 90 degrees fahrenheit, while hot-smoked salmon is smoked above approximately 120 degrees. The temperature difference results in cold-smoked salmon and a fresher and less smoky flavor, while the hot-smoked version is much smokier. In terms of texture, cold-smoked is more smooth and silky, while hot-smoked salmon is flaky, as if it had been baked. When West Coasters try cold-smoked salmon, they don’t understand why it’s so silky. When East Coasters try hot-smoked salmon, they don’t understand why it’s so flaky. In different regions, the term “smoked salmon” is assumed to mean very different things. Some people may not even know that another type of smoked salmon exists. On the East Coast, smoked salmon traditions have been handed down from Nordic countries, whereas in the Pacific Northwest, people smoke salmon they caught themselves using their own barbeques, so the expectations are just completely different. How is hot-smoked salmon made? The process begins with procuring the highest quality salmon that has been raised in natural, healthy conditions. Salmon sides are cured for a number of hours, often overnight, and then rinsed and smoked at a temperature of over 120 degrees fahrenheit. With hot-smoked salmon, glazes and rubs are very common. These are added after curing and before smoking. Flavors like maple, teriyaki, and black pepper pair well with the smokiness of hot smoked salmon. How is cold-smoked salmon made? Cold-smoked salmon is made the same way as hot-smoked salmon, except for the smoking temperature. Salmon sides are cured and then smoked at less than 90 degrees fahrenheit. Flavors, seasonings, and spices can be added during the curing process. Dill is a historically popular flavor combination. We carry a Tanqueray Gin-cured smoked salmon with a secret blend of spices that is fantastic for entertaining. For the most part though, the cold-smoked salmon process is designed to preserve the natural flavor of the fish. The light curing and fruitwood smoking allow the natural salmon flavor to really shine through. How should hot-smoked salmon be used? Any kind of salmon can be eaten cold right out of the package. No fancy treatment is required. If you’d like to cook with smoked salmon though, then hot-smoked is the best type to use. It’s flaky texture goes well in hot dishes like salmon fettuccine or a salmon omelette or scramble. It can also be cooked in creamy dips, soups, quiches, or tart fillings. How should cold-smoked salmon be used? Cold-smoked salmon is best enjoyed cold and fresh. In other words, don’t cook it or bake it. Top bagels and cream cheese with thin slices of cold-smoked salmon and capers. Use it in homemade sushi rolls, on crackers, or on blinis. Cold-smoked salmon is the best for tiny bites and morsels served during cocktail hour. You can order it in the right quantity based on your needs, or should we say desires. And, just like hot-smoked salmon, you can devour it right out of the package with no need for add-ons. Do you have any other questions about buying or using smoked salmon? We can be reached via email at hello@solexcatsmo.com or via phone at (845) 895-3361.